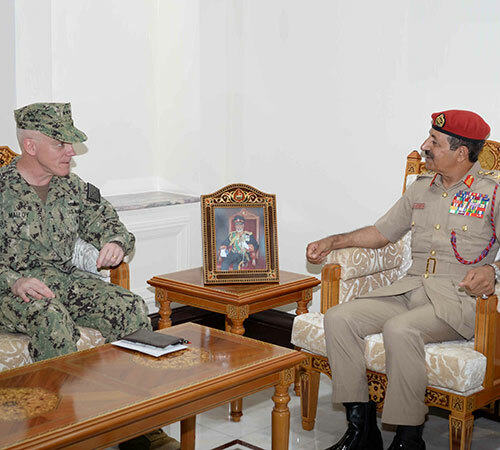 Mohammed bin Nasser al-Rasbi, Secretary General at the Omani Ministry of Defense received in his office Vice Admiral James Malloy, Commander of the US Naval Forces Central Command and his accompanying delegation, currently visiting the Sultanate. The two sides exchanged viewpoints and discussed several matters of common concern, Oman News Agency (ONA) reported. The meeting was attended by the US Ambassador to the Sultanate. Furthermore, Lt. General Ahmed bin Harith al-Nabhani, Chief-of-Staff of the Sultan’s Armed Forces (SAF) also received in his office at Mu’askar Al Murtafa’ (photo) Vice Admiral James Malloy and his accompanying. Lt. General al-Nabhani welcomed the guest, who expressed his delight to visit the Sultanate. The meeting exchanged viewpoints and discussed several issues of common concern. The meeting was attended by Brigadier Saleh bin Ahmed al-Hinai, Head of Military Protocols and Public Relations at COSAF, SAF Senior Officers and the US Ambassador to the Sultanate. In another development, Major General Salim bin Musallam Qatan, Commandant of the National Defence College (NDC) received at the College’s premises in Mu’askar Bait Al Falaj Major General Rupert Jones, Commander of the British Standing Joint Force and his accompanying delegation. The two sides exchanged cordial conversations and viewpoints on matters of common concern. The meeting was attended by the Military Attaché at the British Embassy in Muscat. Major General Rupert Jones and his accompanying delegation also visited the Maritime Security Center (MSC). They were received by Commodore Mansoor bin Mohammed al-Kharousi, MSC Chairman. The British guest was briefed on the MSC duties, tasks and roles, represented by managing and leading maritime security operations against marine risks, including search and rescue operations and the protection of the marine environment from various risks. The visiting delegation also viewed modern devices and equipment used in supporting maritime security operations. Lastly, Major General Mattar bin Salim al-Balushi, Commander of the Royal Army of Oman (RAO) left Muscat for the State of Qatar to attend the closing activities of (Al-Adheed 2019) exercise, which was implemented by the Qatari Armed Forces Wednesday.